Advantages are - unrestricted clean flow of fluids, no fluid entrapment areas, and all PTFE wetted surfaces internally. Available as standard, stocked fittings in the listed sizes, or in other sizes to special order. Higher Pressures & Temperatures possible with Special Clamps and appropriate Seals. Note: The inside lip of the Aflex flared face design is hot formed to a square edge. This prevents a gap for fluid entrapment between the rubber seal and the sealing face. 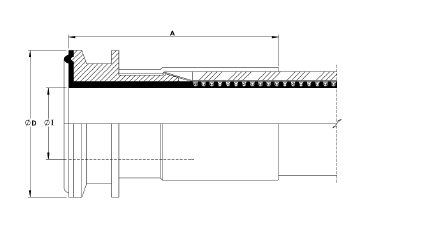 Other suppliers designs have rounded edges, which opens a gap for fluid entrapment. This fitting design is available to special order. No separate seal is required for this design, eliminating any seal compatibility problems. **3A- For assemblies with nominal hose bore under 0.75", the maximum assembly length is 457mm (18in) and can only be supplied specifically for 3-A Standard 17-and-23- compliant filling and packaging machine applications. For more information see 3A Sanitary Fittings. Note: The 7/8”, 13/8” and 17/8” hose sizes can only be supplied as assemblies with lined Sanitary Triclover (or I-Line fittings) at BOTH ends, because other types of fittings (Flange, Camlocks etc) are not available for these sizes of hose.